I love when fashion and beauty come together to forge designer/beauty product collaborations. The two industries are inextricably linked (though they are not THE SAME, as my former finance-industry coworkers seem to misunderstand). In the sage words of Rob Base and DJ E-Z Rock, it takes two to make a thing go right. 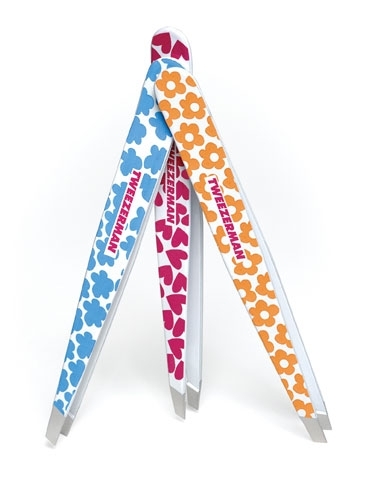 As such, Agatha Ruiz de la Prada has designed a collection of tweezers for Tweezerman in three vibrant color patterns: magenta hearts, blue clouds and orange flowers. These festive tweezers make the mundane task of ridding your face of unwanted hair tons more fun. Each pair of dressed-up tweezers comes with its own matching vibrant packaging and a complimentary white leather tweezer case. At the event, I caught up with Ramy Gafni, brow specialist to the stars who sang Tweezerman’s praises. I also had a chance to meet the fabulous Agatha Ruiz de la Prada who was rocking, as you can imagine, a pair of wildly festive pants to her party. Fierce dresses, each in different designs of pink and red ruffles, lined the walls of her SoHo boutique. It was congruent with her Spanish sensibility, best exhibited by her preference to reside in her native Madrid. I like that she’s internationally known (she has outlets in Milan, Paris and as I mentioned, New York), though she’s not known to rock the microphone.